There are a handful of photographers whom I've admired and tried to emulate over the years. Michael Orton is one of them. His soft, glowing, almost ethereal photos have always been special to me. Even if you don't know Orton's name, there's little doubt you've seen his photos, or ones based on his technique. Simply put, he combines two photos of the same subject, one in sharp focus and the other blurry. In the past, I've explained how to make your own Orton-effect photos using Corel's Paint Shop Pro. Today I'd like to update that technique to show you how it's done with Adobe Photoshop Elements. To get started, choose a photo. It can be anything, but I've gotten especially good results using people and nature photos--just pick something and see how well it works. After you try a few, you should develop a sense of what kinds of images look best with this effect. Open the photo in Photoshop Elements. As always, though, you can apply these instructions to almost any photo editing program. Only the specific menu commands will vary. Our first task is to make copies of the photo. One will be sharp and in focus, while the other copy will be blurry. Choose Layer, Duplicate Layer. Name the layer "Sharp," so we don't lose track of which seemingly identical layer is which. Now create a second layer in the same way, but name this one "Blurry." In this screen shot you can see the two layers, along with the original photo we started with at the bottom of the stack, named "Background:"
Next, in the Layers Palette on the right side of the screen, select the layer named Sharp and change its blending mode from Normal to Screen. You won't see anything change because the top layer is obscuring the view, but what we did was to simulate overexposing the bottom layer. You can see this for yourself by temporarily turning off the top layer so you can see through it. To do that, click the Visibility icon--shaped like an eye--to the left of the top layer. You should see the photo get brighter. Turn the top layer's visibility back on when you're satisfied. Now let's combine the bottom two layers. Select the Sharp layer, right-click, and choose Merge Down. You should see the bottom layers combine into one. We just need to blur the top layer, and we're done. Select the Blurry layer and then choose Filter, Blur, Gaussian Blur. This is where you can apply some artistic judgment: Use enough of the effect to obviously blur the scene, not so much that it renders the entire photo and all of its details completely illegible. I can't suggest a specific value, because Gaussian Blur's impact varies depending upon the resolution of the photo. But as a rule of thumb, you might want to start around 14 and see if you like the effect. 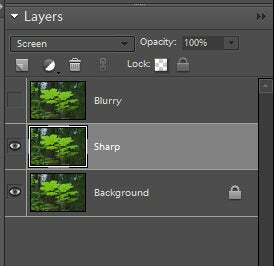 Now, with this layer still selected, right-click it in the Layers Palette and change the mode from Normal to Multiply. You should immediately see the effect. The final step is to dial in just the amount of Orton effect that you want. 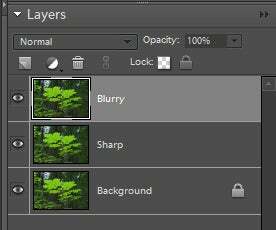 Use the Opacity slider in the Layers Palette to adjust the brightness and blur. On the left you can see what my photo looks like when I pull back the effect to about 75 percent. Adam says that he took this photo with a Canon EOS Rebel T2i at ISO 400, using a 30-second exposure. Olga captured her dog Meatball in his natural state with a Nikon D70. To see all of this month's winners, visit the December Hot Pics slide show. Visit the Hot Pics Flickr gallery to browse past winners. This story, "Apply the Orton Effect for Glowing, Vibrant Photos" was originally published by PCWorld.